TPC Overall Rank: #272 out of 2933 rides. I've ridden Canyon Blaster dozens of times and it is a fun little indoor coaster. The pre drop at the beginning gives a surprising amount of speed. The actual drop is floaty and The loops kind of forces your head forward which can lead to some nasty head banging if your not prepared. Then there's a hill which can have some traditional arrow ejector airtime in the front. Then follows a double corkscrew which is always my favorite element on arrow loopers. Then comes a little hill that gives another pop of ejector air. A helix follows which gets frighteningly close to the mountains. Overall a fun ride, smooth for an arrow looper and the fact that the ride is indoors adds to the charm of this little ride. Canyon Blaster was a pretty fun coaster. First off, the ride interacted very well with the canyon and made the ride much more exciting. The first drop was short, but fun and it gave some good air. Both vertical loops were fast and very smooth. Then came the two corkscrews, which were fairly smooth for an Arrow, as there was minimal headbanging. Afterwards there was an amazing helix through the canyon. Im not a steel looper fan at all---its not my type of ride. 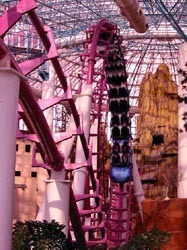 However, I thoroughly enjoyed Canyon Blaster and often bring it up as one of the most underrated rides out there. Its a perfect quick one-two punch of a ride. If it impressed me, theres a good chance itll impress you! Its a pretty smooth ride, actually. But its only smooth if the restraints are tight on you. While your going up the lift my friend & I figured out that if you breathe in while pressing the restraints down, it tightens. Because if the restraints are loose, youll get a little headbanging. But overall...its a fun ride, thats smooth and it has a decent speed. If you sit on the right side you feel like your gonna fall out on the corkscrews but its still fun. This was my first big coaster, and I loved it! About as good a ride as you can get for an indoor coaster. 4 inversions, fair speed, and good transition between elements. The tunnels through the fake mountains are my favorite part. Another stupid thing that I noticed that others might not have, it is the cleanest coaster station I have ever been in. Now that I took another trip to Vegas, heres an even better review than my previous one. This ride is actually a 9.5 IMO. You dont always need to have a big coaster to have an excellent one. Those Arrow trains are very comfortable, if you dont worry about the restraints. On this one, theres no room to raise your arms, but that would just give us more headbanging. The back seat on this ride is the place to sit. 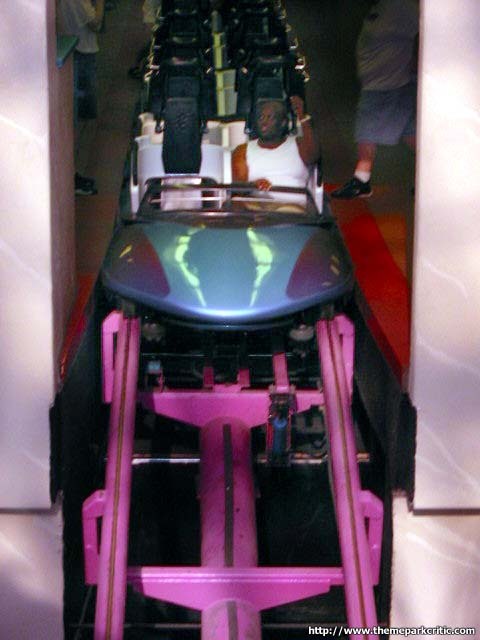 In the back, people get some intense airtime on the first drop because they get pulled down the drop. The first loops are nice, but while going through the turn between the corkscrews and loops, I got some headbanging. There was a bit more in the corkscrews. The unique helix through the mountain was also a bit rough, but still fun. But after that, were already back in the station. No surprise. Most Arrow coasters have simple layouts like this one. I enjoyed this ride. It has some headbanging, some airtime, and a lot of fun. My favorite ride in the dome. 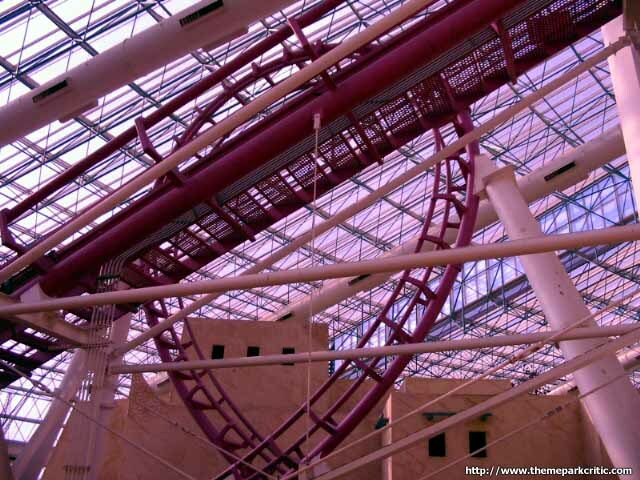 This was a nice indoor looper but had few elements. I rode this when it opened 1990 and its now much rougher. 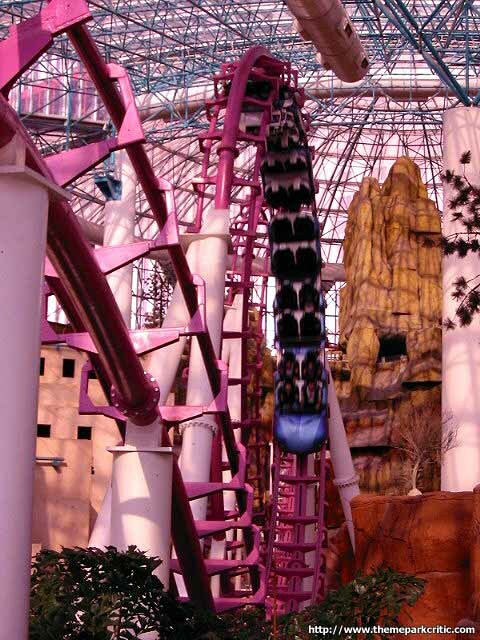 The layout of the ride is 70 ft drop, two loops, turn, two corckscrews and a long turn and a few small drops in the fake mountain. I got a headache because it was preety rough but a nice addition to Circus Circus. Dont pay much for it though. good small coaster, but nothing special. maintain speed well for such a low first drop. its strange having the air conditioning blow on you versus the sun beating down. THE BEST COASTER I RODE IN VEGAS! Granted, its ride is helped by its low price (I only expected a $5, and got a $7 ride ... vs. SPEED or ME which had me expecting a $10+ ride and were $7s). Its a typical arrow style looper, with good fun. The building/terrain helps quite a bit and the proximity of nearby rides and structures add to the thrill and speed feelings.